Social Apples details a change employed in an update to Apple's iBooks application released last week that detects whether a device has been jailbroken using one of several tools, and if the device has been found to be jailbroken, refuses to open content purchased from Apple's iBookstore. Since using the greenpois0n jailbreak, I have been unable to open some of my iBooks that I rightfully purchased from the iBook Store. I thought it was a problem with the downloaded books, so I re-downloaded them. 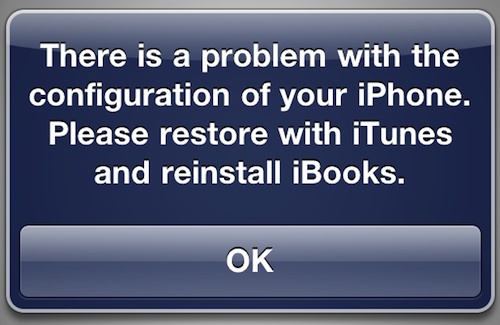 That didnt work so I removed the iBooks from my iPhone and re-syncd them from my computer... still no luck. Then I stumbled on a tweet from @comex tonight that really blew my mind. According to noted jailbreak author @comex, whenever a user attempts to open an eBook purchased from the iBookstore and containing digital rights management code, the new iBooks tries to run unsigned or improperly signed binaries as a test to see if the device is jailbroken. If those binaries run successfully, the device is flagged as having been jailbroken and the eBook refuses to open. Restoring a device from iTunes obviously removes the jailbreak, again rendering the device in compliance with Apple's standards. Apple's tactics are of course drawing some scrutiny from jailbreak fans, many of whom are pointing to recent actions by the U.S. government to explicitly allow jailbreaking. Consequently, Apple's move to prevent access to legitimately purchased iBookstore content just because the user attempts to view it on a jailbroken device is seen as interference with legal usage. Update: Reports have clarified that the jailbreaking detection mechanism has been present since iOS 4.0 and is part of the fairplayd DRM check. It has only recently been generating attention as newer jailbreak methods such as greenpois0n have opened up Apple's restrictions enough to trigger the blocks.